Just over a decade ago, a student in Vancouver, British Columbia, changed high schools three times as his family’s finances plummeted. Coupled with a severe case of shyness and anxiety, the moves left him feeling invisible. Few of his classmates even noticed Stefan James. When they did, it wasn’t good. The humiliation made the shyness even worse. James couldn’t relate to others, hold a conversation, or pluck up the courage to attempt a relationship of any kind. “I didn’t enjoy learning. I’d get so much anxiety before a class presentation that I would skip it and fail the assignment,” says James. His grades declined as a result, and he failed science one year. As his doubt and loneliness intensified, James withdrew further from those around him and became addicted to video games. “When I played video games, I could be whoever I wanted,” he says. In other words, he could be anyone other than the person he didn’t want to be — himself. James developed a crush on a fellow gamer he knew only online. When he was 16, he built up the courage to go to a party with others who played the same online game, Multi-User Dimension. When he met his crush in person, he fell hard. In his heartbreak, James picked up a book from an otherwise forgettable relationship author, who taught him something critically important: Everything he disliked about himself was the result of his choices — and by making different choices, he could become a new person. At 17, James turned off the video games and decided to do whatever it took to improve his social skills. “I signed up for classes in public speaking, acting, and improvisation — even though I often had too much anxiety to actually go,” he says. James needed to catch up if he ever hoped to date someone who wasn’t an avatar. “I went to coffee shops and bars and tried to talk to women,” James says. “I knew if I got comfortable with those conversations, I’d start building my confidence.” But being comfortable didn’t mean being effective. “I got rejected a lot,” he laughs. Before long, James found he could talk to anyone easily. To his own surprise, he developed charisma and a strong sense of humor, which earned him a lot of positive attention. By his early 20s, James could talk to anyone. James turned his new skills and hard-earned perspective into a side hustle as an assistant to an experienced dating coach. He’d continued working for the family business after high school. Against his father’s wishes, when James was 21 he and two friends started a business to help other men improve their social skills and confidence. James made no more than $2,000 a month, barely enough to get by in a city like Vancouver, where one-bedroom apartments rent for that much, a beer costs $7, and a McDonald’s meal is over $10. James paid a friend $500 a month to live on his couch, but he didn’t spend the rest on beer or Big Macs. Instead, he hired the best life coach he could afford for $500 a month. After about four years of hard work but minimal business growth, James and his partners accepted that there wasn’t enough demand for their coaching in Vancouver, and they shut down the company. James continued coaching a few clients, but he needed something sustainable. He’d been teaching himself internet marketing for the business, so he decided to try it full time. James attempted this for a while, trying different income streams including selling e-books and affiliate marketing, where he earned a commission promoting others’ products. He was lucky if he made as much as he did coaching in a month, and usually averaged a few hundred dollars — not nearly enough to get him off his friend’s couch. James’ break came when he discovered Kindle publishing. He’d already written a substantial amount of content for his other marketing efforts, so he packaged it into e-books and sold them on Amazon. He made money right away. Empowered by those earnings, James dove headfirst into Amazon publishing around 2011. Within the first year, his income skyrocketed. So in 2012, James created Project Life Mastery — a blog and YouTube channel that would document his experiences as he mastered his life. His mission was to demonstrate life’s unlimited possibilities for those who truly commit. He wanted to help others master all areas of their lives, including health and fitness, emotional well-being, relationships, finances, and spirituality. James didn’t design Project Life Mastery to make money, but his content became so valuable that it attracted clients who wanted to pay for coaching. Many who followed James and his methods wanted to replicate his lifestyle, so he began teaching them how to start their own online businesses. Now James offers courses on life mastery, morning rituals, book publishing, affiliate marketing, selling on Amazon, and creating online businesses. 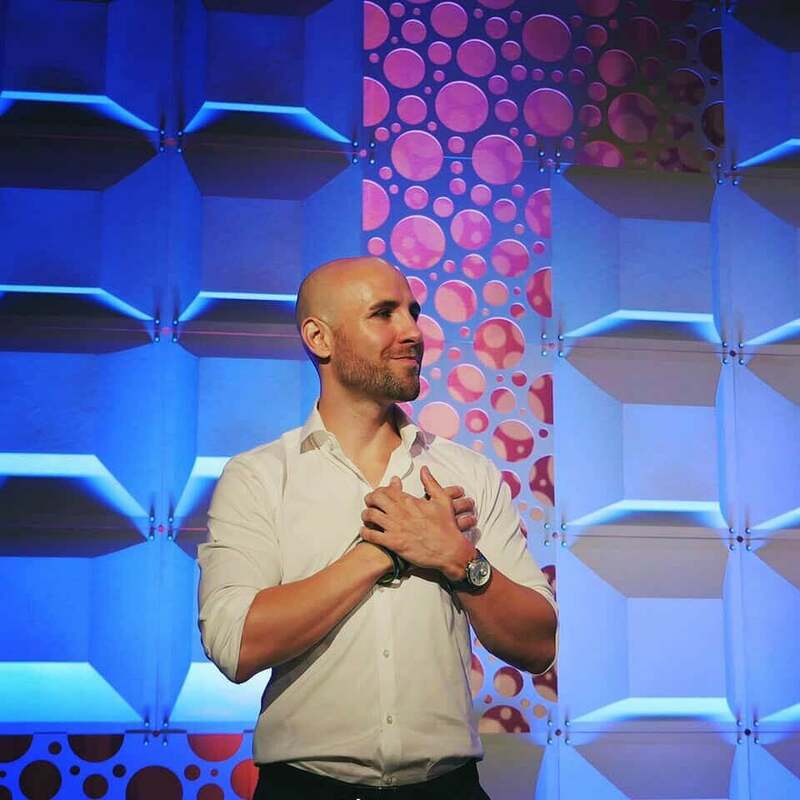 He still does some coaching, primarily through his mastermind Online Business Mastery, an intimate event for other entrepreneurs. Today James helps others master their lives through his courses, coaching, and masterminds. James shares the progress toward his financial goals on his website. While most would balk at openly posting their private finances, he wants to demonstrate the impact of rituals and goal setting. He hit CA$1 million in net worth around age 27 and at 32 has made over CA$3.7 million this year. He didn’t just master his finances; he began competing in fitness competitions and strengthened his mental, emotional, and spiritual well-being as well. But there was one area of life he had yet to win at: relationships. Life mastery and love’s mystery. So James suggested something perfectly normal for how he’d been living since he fully embraced life at 17. “I offered to go to Brazil with her, and she was game.” James was preparing for a fitness competition at the time, so he met her in Brazil as soon as it was over. James entered a fitness competition in 2014 to push himself mentally and physically. James proposed to Buree in Santorini, Greece. James and Buree moved to Panama in June 2018, and he proposed in Santorini, Greece, two months later. When they’re ready for a break from exploring the world, they plan to move to California and start a family. James says it’s no coincidence he met his fiancée after he became successful. “Your mindset determines your success. I’ve seen people succeed and fail with the same strategies because they had different mindsets. I’ve also seen them achieve financial success at the expense of their relationships or health.” He says that’s why it’s important to focus on your identity, beliefs, and rituals. There is no getting without giving. If there is such a thing as mastering life, it’s this: “Find something you’re passionate about and that you enjoy, then share it,” says James. For James, that includes caring for others, which he says gives him unlimited motivation. He’s helped build schools in Ethiopia, Kenya, Ecuador, and India with Imagine1Day, Free The Children, and WE.org. He has also built houses in Nicaragua and El Salvador with TECHO. He says this work is a big part of his mission and the legacy he wants to leave. James in Ethiopia, where he has helped fund several schools. James realizes it’s ironic that a boy who disliked school now places such an emphasis on education, but he believes that knowledge got him where he is today. When he isn’t coaching others, he still works with his own coaches and teaches himself new things — a far cry from the shy boy who hated learning. Learn more about Stefan at Project Life Mastery or connect on Facebook, Instagram, or Twitter.